The new mildly sweet flavor and certified gluten free formula makes this sauce versatile enough to use as a marinade or for stir-frys and fried rice. Marinating and seasoning meats, fish and vegetables is a snap with San-J Teriyaki Sauce. Marinate meat for 30 minutes and cook as desired, or marinate vegetables for 10 minutes and saute or steam. Look for the Certified Gluten Free logo on the label. This sauce is awesome. Tastes great. This product is a staple in my gf kitchen. I use it in such a lot of dishes, including meat loaf, hamburgers, marinades, stir-fries or just on plain rice. used it to marinate chicken wings. good flavour and GF! Favourite gf sauce by far! Taste is great! I use it for marinating or for stir frys. My favourite teriyake sauce even before making an effort to eat GF,. Good consistency, tasty robust flavour without being overpowering. A great marinade or added to a stir fry to boost the flavour. Great product - I find it to be identical to the non-GF version from Kikkoman. Fares well in my stir-dry and satÃª recipes. I always have it stocked in my kitchen! Great GF sauce .I marinate fish and chicken with this sauce and tastes great on theBBQ. Since going GF two years ago, I've stayed away from such sauces. I am also very sensitive to MSG. I've only tried this GF teriyaki sauce so far, which my mother introduced me to, and it renewed my enthusiasm for cooking. It's a thick sauce that is flavourful and natural tasting, and I don't experience any food reaction! I will be keeping this stocked in my kitchen. 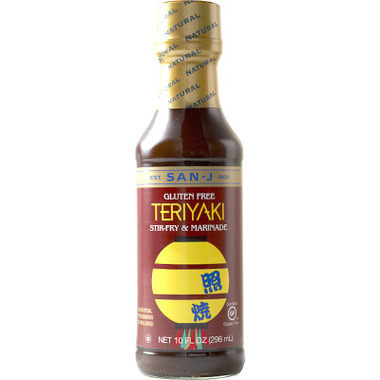 Not as favourful as other teriyaki sauces, but a good option for those who are gluten-free.